Beneath Rome lies yet another city Enjoy Italy’s Best tour of Underground Rome and the Appian Way giving you a chance to explore the city’s layers and most fascinating hidden secrets. Rome is uniquely built on layers of history, each civilization laying their foundations directly on top of the last, making it possible to travel from modern to ancient Rome as you descend under the current city level. 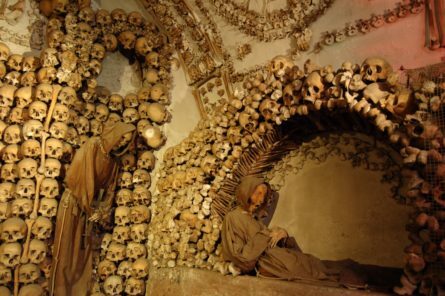 – Church of the Bones: an entire church adorned with bones from 4,000 deceased Capuchin friars who lived in the church’s convent over many centuries. – Church of San Clemente: the church’s three-level division spans 15 centuries of history. From the medieval church on the top level, travel underground to see that it actually rests on the substructures of a Roman house dating back to the first century AD! A visit to Appian Way is not complete without a stop at the Catacombs — San Callisto or San Sebastiano. Burials were forbidden within the city walls and these early Christian cemeteries are named for the wealthy individuals who would often donate the property for the burial grounds. The Catacombs were in use until the 5th century and contain the remains of many martyrs. Not thoroughly explored until 1850, the architecture of the catacombs is very different with various sized passages located more than 20 meters below ground level! We offer the option to extend your tour with a visit to Castelli Romani, a region outside the city that is beloved by the locals. The rural landscape is filled with castles and volcanic lakes, creating a picturesque backdrop for charming villages that produce wine among other local products. Here our clients can have a true taste of Rome! None of the venues visited on this tour permit photography., Appropriate dress is required for entry into some sites on this tour: knees, shoulders and backs must be covered.